Bianca Rose in Keswick, Cumbria sleeps 6 people. Bianca Rose in Keswick is a spacious town house, just minutes away from the town centre. 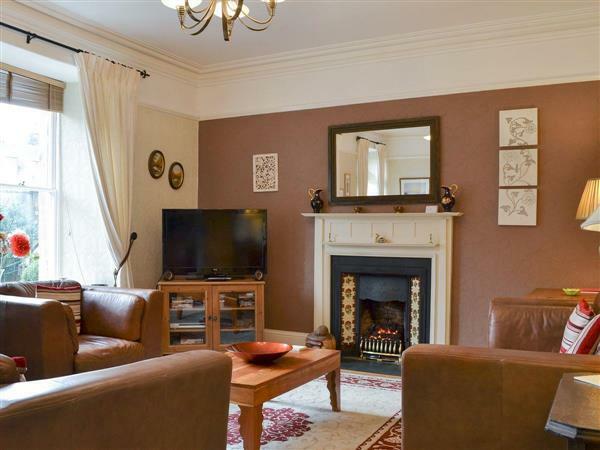 Perfect for couples and families, you will enjoy the comfortable accommodation, from the moment you step into the entrance hall with its charming wooden spindled staircase inviting you to this warm and welcoming family home. The property enjoys views of the local fells from the upper floors, and is very much a traditional Victorian home with high ceilings, original plaster details and a stunning stained glass piece featuring, of course, the Bianca Rose. Accommodation is over four floors with a large living area and a well-equipped dining kitchen to the first floor; two generous sized double bedrooms can be found on the second floors, whilst the master on the upper floor has dual aspect windows with spectacular views of the surrounding fells, as well as its own en-suite toilet and hand basin. Centrally located, this house is perfectly situated to explore the Lake District and the market town of Keswick, which has an abundance of outdoor shops, restaurants and cafés, and was voted one of the most dog-friendly places in Britain. You will also find many walks for all levels nearby. Why not start your ascent on the famous Cat Bells with a gentle crossing of Derwent Water on one of the cruises from Keswick Launch, or entertain the family at the many attractions that will capture their imagination? A whole host of outdoor activities can be found in the area, and for that special evening out why not try one of the many fine dining places to eat in, or catch a play at the Theatre By The Lake? For more traditional Lakeland nights, have a taste of the local real ales that are served in the bars. There is a shop ¼ mile from Bianca Rose in Keswick, with the pub and restaurant ½ mile from Bianca Rose. Ground Floor: Bianca Rose in Keswick has a step to the entrance. Entrance hall: With storage for boots and coats. First Floor: Living room: With gas coal-effect fire, 42 Freeview TV, DVD player, iPod dock, CD player and laminate floor. Kitchen/dining room: With electric oven, electric hob, microwave, fridge, freezer, dishwasher, washer/dryer and laminate floor. Bathroom: With cast iron roll-top bath, shower cubicle and toilet. Third Floor: Bedroom 3: With super king-size bed, sloping ceilings and en-suite toilet. Gas central heating, gas, electricity, bed linen, towels and Wi-Fi included. Travel cot and highchair available on request. Welcome pack. On road parking. No smoking. Holidays at Bianca Rose run from Saturday to Saturday. Pets allowed at Bianca Rose. For a better idea of where Bianca Rose is, you can see Bianca Rose on the map below. Bianca Rose is in Cumbria; should you be on the lookout for a special offer, you can find all the special offers in Cumbria. It's always worth checking to see what is on offer at the moment. Do you want to holiday near Bianca Rose (UK1179), you can see other cottages within 25 miles of Bianca Rose; have a look to find your perfect holiday location.